“Seventy-two hours!” said the man at the mobile service centre in Entebbe town. “There are many people who have registered a SIM. It should be activated by Monday or maybe Tuesday, you just have to be patient.” Once again that catchphrase T.I.A was ringing in my ears. I certainly hope he’s right, because where I’m going, there’s no service centre to go to and rant if I’m not connected by then. So I turned on my heels, gave a small harrumph and did the 20-minute schlep back to my hotel on foot. While I was dodging the buses, cars and curb-crawling motorcycle hustlers, I noticed in the trees above me the most magnificent birds. They look like a cross between a stork and an Undertaker bird. Now I’m no twitcher, so if you know the species, please do enlighten me. The sheer size of these things is quite incredible, not to mention the wing span and their beaks. Their nest looks like my woven laundry basket back at The Boma. I love the fact that other little yellow birds have also made their nests close by. Perhaps they feed on leftovers, or there’s some sort of altruistic partnership going on. Whatever it is, the scene looked like a small neighbourhood gathering. As I stood underneath the big birds, I couldn’t help thinking that if an unfortunate accident were to happen, I would return to my hotel looking like I’d been paint-balling. So I quickly crossed the road to snap at a safe distance. Back at the hotel I noticed that the Germans had gone. They must have left early this morning. All the better for me. Within ten minutes I was by the pool, novel in hand. I must have been out there for about an hour when I decided to call it a day. Just as well, because padding down the stairs was a well tanned man; probably 50-something with coiffed hair like Richard Hammond. Dressed in chinos with his bare chest puffed out, he threw a towel down on a lounger directly opposite me. In the blink of an eye he’d stripped to reveal a pair of lycra-navy coloured budgie-smugglers (The Northerner’s favourite phrase for Speedos). I dressed faster than you could say factor-50 and went to check my email. The wee Bern had arrived (the Scottish student from Roehampton). I think I’m justified in affectionately calling her that, as there is nearly 15 years difference in our ages. I walked back into town to meet her and we went to the Ugandan Wildlife Education Centre (UWEC) to look at the animals. She joined me for dinner this evening and we both abstained from the drrr-ink! Here are some of my snaps from today. Tomorrow off to the capital, Kampala. PS: JUST IN……stork-like birds are called marabous and little yellow ones are weaver birds. There, we’re all enlightened now. Thanks Vernon! Cheers Lucy, glad you’re enjoying the post. Thanks for the twitter message, sorry not had time to reply. Off to bed, early start tomorrow. Hope alls well in MK. Marta!! How great to hear from you. I hope you and Nick are well and have settled back into the Jamaican way of life. I’m heading to Kampala today to meet up with some scientists. Hope to write more tonight. I have been inundated with this info now – but thanks twitcher!! Have a great trip away in the Alps, enjoy your bird watching too, hahah! 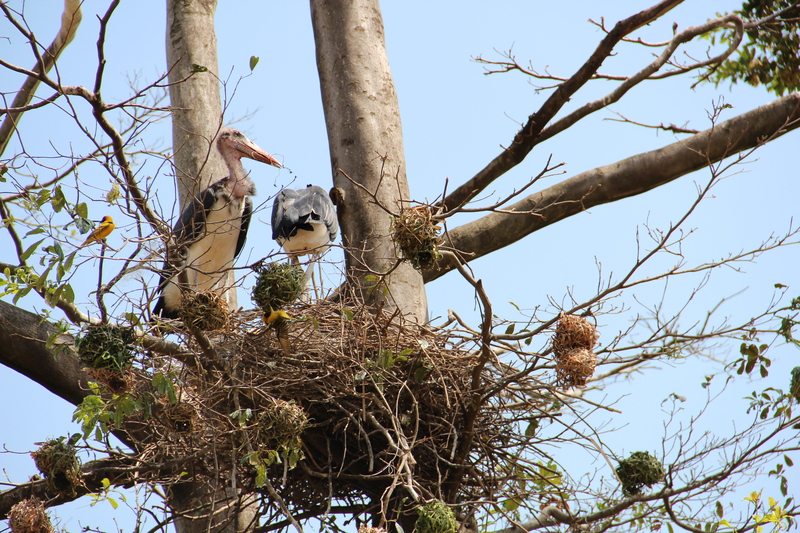 thanks again for your news,on the picture it looks like a Marabou stork, and i think the smaller nest are a member of the weaver bird family. Maybe someone will be more acurate. looking forward to your journey through this news page. Day 3 and still sober.